Arrive at alternate airport, check. International check-in, check. Annoying security check, check. Terminal E16, check. I'm relaxed, check. *smiling* Okay, called all the necessary people - mom, one of my sisters, Linda W. Linda = awesome! I gave her a call initially when I missed my flight, she was so sympathetic; she didn't have to but she was. Well, called her again when I was finally at the terminal - she was happy, I was happy, so whatever happened earlier (thanks a lot Delta, NOT!) this morning didn't even matter amymore. I asked for my professor's cell number so I could get in touch with her when I got to JFK. She gladly provided it and assured me that she would contact her also. Wheww... the world is perfect again! *laughing internally* See you in New York!!! Hello New York! Finally here; need to go check-in and find the rest of the group. Called Linda again to let her know that I had arrived and was trying to reach my professor but kept getting voicemail. Before I continue, I should point out that there were two groups who went on this trip; my group from one city and the other group with my professor from a different city. We were all supposed to meet at NY. 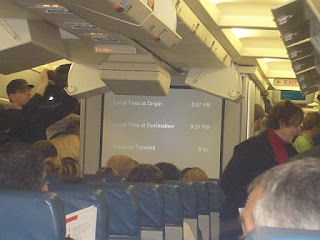 Alright on with the story - then Linda informs me about the second group's (my professor's group) flight being cancelled! WHAT? No way! But they were supposed to be in NY even before my group? So anyway, they got on the noon flight and will get to JFK by 4:45PM. Well that's funny cause that's when our flight to Barcelona starts boarding! Hahahaha... Okay I probably shouldn't have laughed but after the day I just had earlier, I just couldn't help myself. Anyway after getting myself something to eat and very relaxed, i found the rest of my group at terminal 15. Woohoo! Told them about my 'horrible ordeal', the second group issue, and then we just pretty much waited and hoped that we'd all get on the plan to Spain! A Boeing 767 was going to be our temporary abode for the next 6hours and 50 minutes! It's a huge aircraft; haven't been on one of these since I left Nigeria in 1999. Geez! Hmmm... this should be quite interesting though. Yay, the other group made it into the plane! I could definitely see my professor trying to stop by our seats to say hi. So much for the dramatic effect I was hoping for - Linda had sarcastically told me earlier that if all else fails, I should try to stall the plane so that the other group could catch up. Honestly I don't know why or how she knew I was capable of doing that hehehe. So anyway I got myself acquainted with the passenger seating next to me already; she seems nice, I like her cause of her down-to-earth personality. I've forgotten her name now (also positive she forgot mine too!) but I'll be sure to get it again by the time we get to our destination. She's originally from Venezuela but her travel itinerary started from Miami, then Cincinnati, then New York, and finally Barcelona! Wheww! I think it's a Delta airline thing - note to self: try as much as you can to avoid Delta at all cost. So she's on her way to visit her boyfriend who got into a car accident and is in the ICU. I wished him well and hoped he'd have a speedy recovery. I told her I was a student (after she asked me where I was travelling from) going on a study tour with a group of other students. She assures me Barcelona is really beautiful. Well, I can't wait; here I come Barcy! LOL!!! those check in ppl can be really unhelpful sometimes though,it like they r on auto pilot and discretion dey very hard to use!! anyway, goodluck with the rest of gradskl!